MogoBlog MogoLicious Tasty Tip of the Day: No campfire? No problem! Roast your marshmallows over your oven burners. It’s a totally optional step, though we think it really drives the s’mores flavor home. Microwave fluff with 1 tablespoon water for 20 seconds on high. Stir to combine and pour onto a shallow plate. Place crushed graham crackers on another shallow plate. Dip rim of each glass first in fluff and then in graham crumbs to coat. Drizzle chocolate in a circular motion inside each of the glasses. Add all cocktail ingredients into cocktail shaker and fill with ice. Shake until cold then divide evenly between glasses. Place 2 marshmallows on a small skewer (to make 3 skewers total), then roast over open flame. Place on top of glasses and serve. 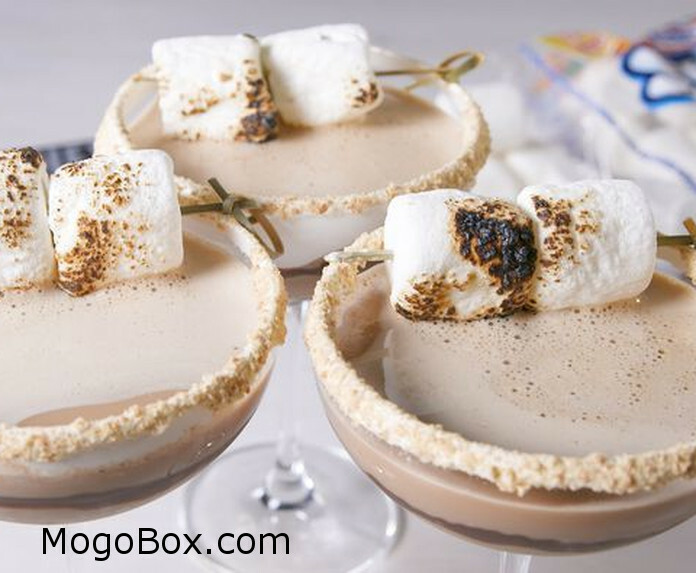 This entry was posted in MogoBlog, MogoLicious and tagged #MogoBlog, Chocolate Chips, Chocolate Liqueur, Creme de Cacao, Graham Crackers, Ice, Marshmallow Creme, Marshmallows, MogoLicious, Vanilla Vodka.